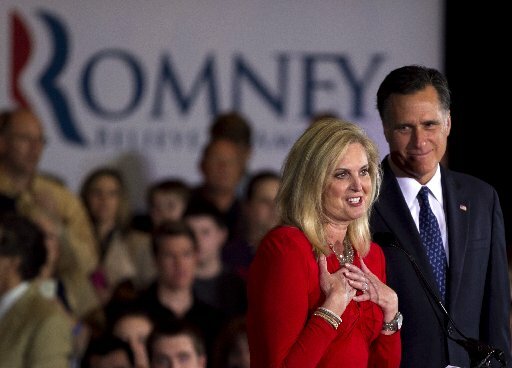 The Midnight Review: Ann Romney: "I Love That You Have No Choice But To Work And Raise Your Children!" Ann Romney: "I Love That You Have No Choice But To Work And Raise Your Children!" "I love that you are not rich like me and you have no choice but to work and raise your children." Mitt Romney believes he can relate to the average voter despite being worth a couple hundred million dollars and having an extremely low tax rate. So does his wife Ann, and even more so since the uproar the right caused when Hillary Rosen said Ann never worked a day in her life despite Ann being a stay-at-home mom (with the help of several domestic servants). Even though the news has moved onto the next big stories, such as the secret service prostitution scandal or the fact that the Romneys drove across the country with a sick dog strapped to their roof, Ann is still stuck on the whole stay-at home thing. Previously she swooned over the idea that she had the choice to stay at home because hubby is worth millions. Now Ann has something to say about those who don't have the option to stay at home - Ann says that she "loves" that people aren't rich like her. "I love the fact that there are also women out there that don't have a choice and they must go to work and they still have to raise the kids," said Romney. Doesn't that echo the sentiments you hear around the water cooler at work?